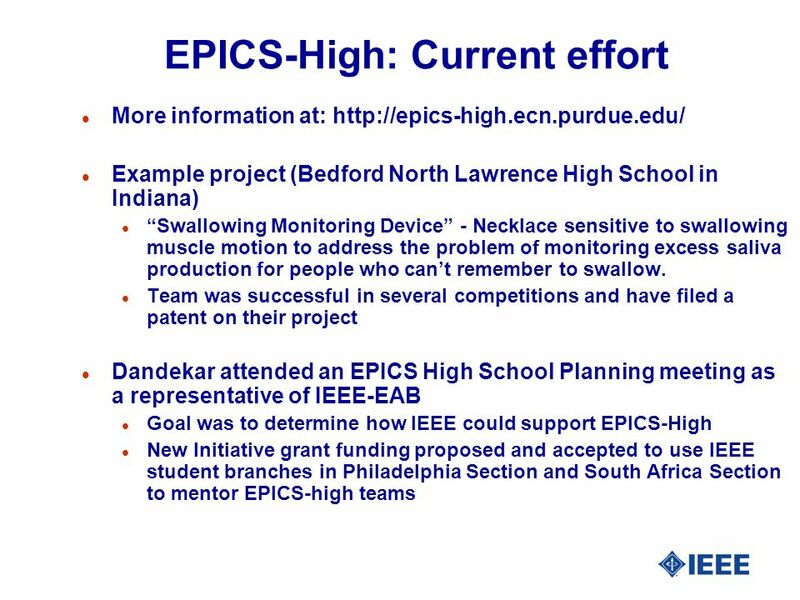 IEEE New Initiative - EPICS High School Kapil R. Dandekar, Ph.D. Saurabh Sinha, Ph.D. 15/Nov/2008 New Brunswick, IEEE Meeting Series. 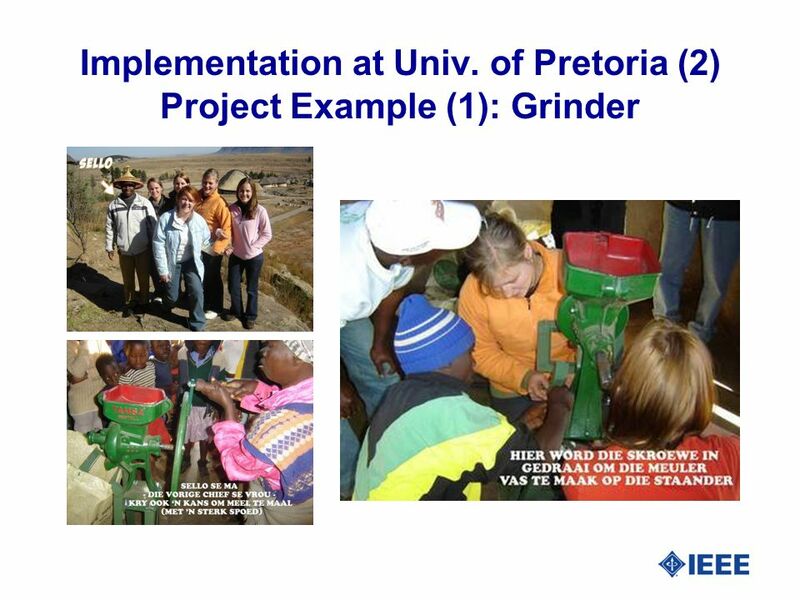 7 Implementation at Univ. 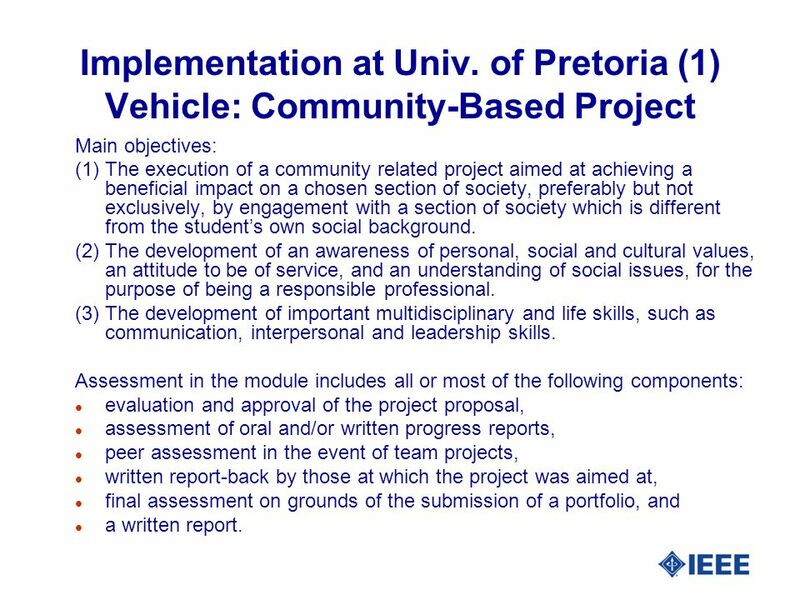 of Pretoria (1) Vehicle: Community-Based Project Main objectives: (1) The execution of a community related project aimed at achieving a beneficial impact on a chosen section of society, preferably but not exclusively, by engagement with a section of society which is different from the students own social background. (2) The development of an awareness of personal, social and cultural values, an attitude to be of service, and an understanding of social issues, for the purpose of being a responsible professional. (3) The development of important multidisciplinary and life skills, such as communication, interpersonal and leadership skills. 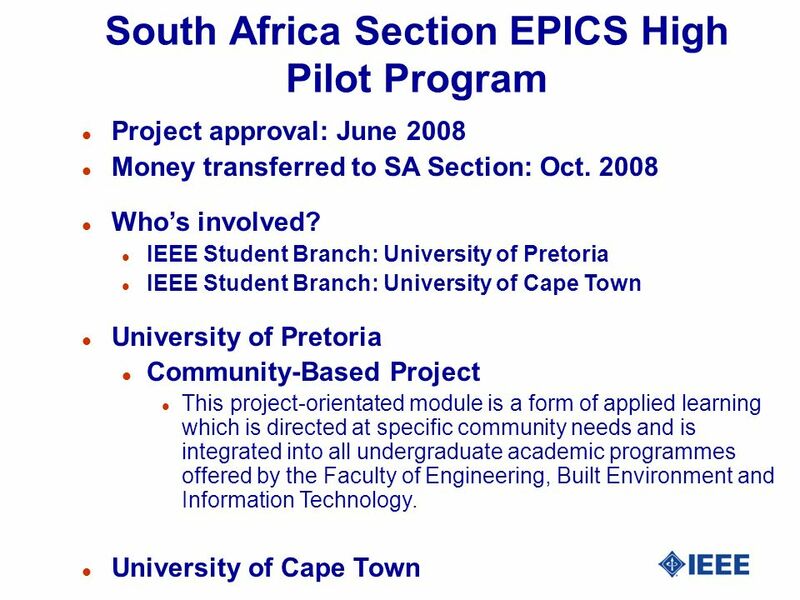 Assessment in the module includes all or most of the following components: l evaluation and approval of the project proposal, l assessment of oral and/or written progress reports, l peer assessment in the event of team projects, l written report-back by those at which the project was aimed at, l final assessment on grounds of the submission of a portfolio, and l a written report. 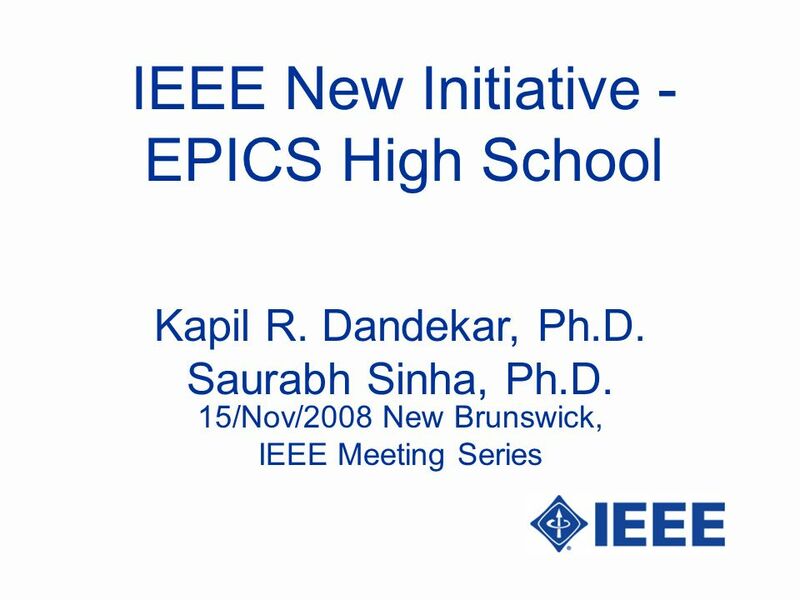 Download ppt "IEEE New Initiative - EPICS High School Kapil R. Dandekar, Ph.D. Saurabh Sinha, Ph.D. 15/Nov/2008 New Brunswick, IEEE Meeting Series." 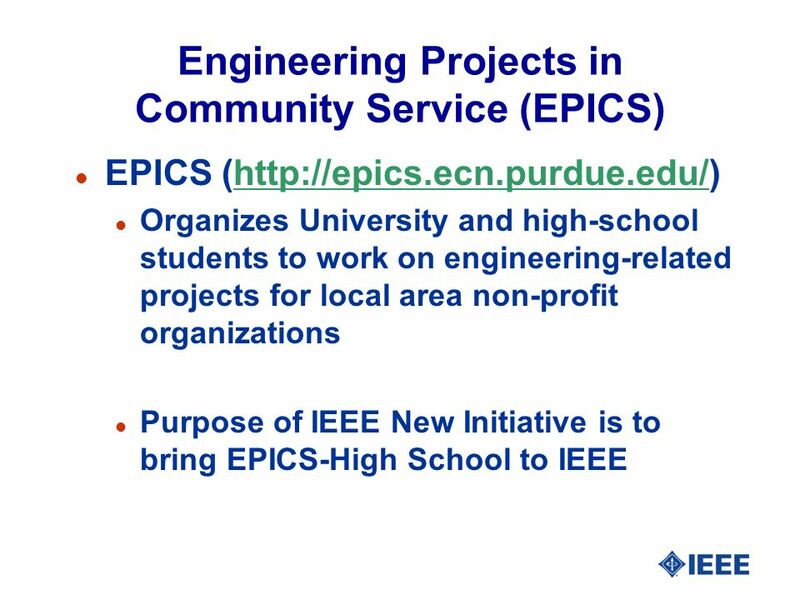 CIRTL Impact on the Nation University of Illinois Urbana-Champaign University of Michigan Carleton College Madison Area Tech College U.S.G.S Purdue University. Pre-University Education and Women In Engineering Learning Station Karen Panetta Kapil Dandekar Douglas Gorham. Action Learning Set: Support for Middle Leadership in Multi- agency settings Summary of progress: January 20th Output from questionnaires: -What. 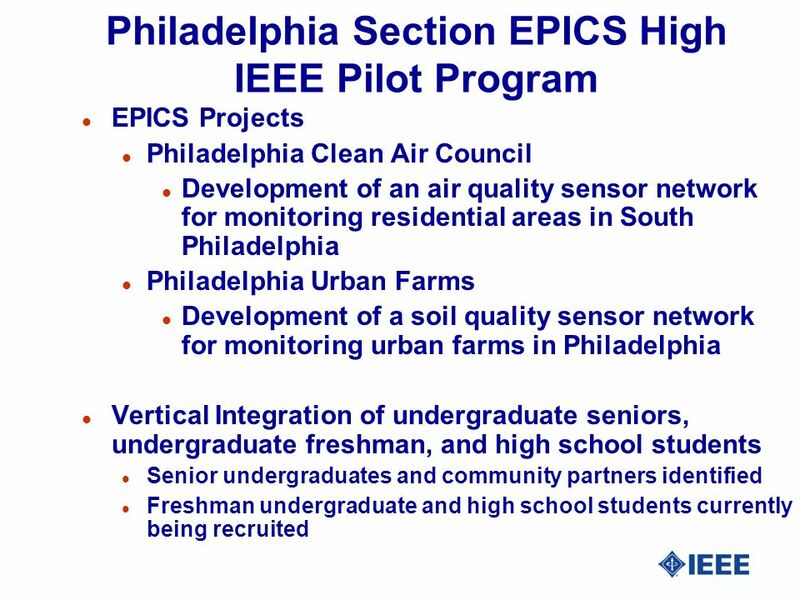 Bernie Engel, Professor and Head Agricultural and Biological Engineering 1 March 25, 2014. 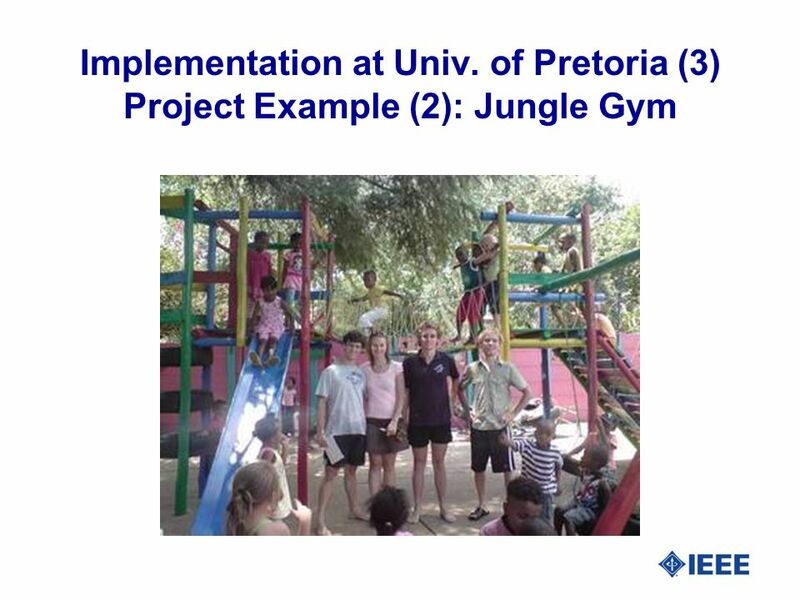 1 Using e and m-learning in a Community-Based Project Module Martina Jordaan Roelf Sandenbergh Faculty of Engineering, Built Environment and IT University. The Nuts and Bolts of Aligning Service-Learning with Content Standards Presented by Lisa Guilfoile Education Commission of the States Lori Gonzalez and. RURAL HEALTH NETWORK DEVELOPMENT PLANNING PROGRAM FUNDING OPPORTUNITY ANNOUNCEMENT HRSA PRE-REVIEW CONFERENCE CALL FEBRUARY 7, 2014 PRESENTER: AMBER. 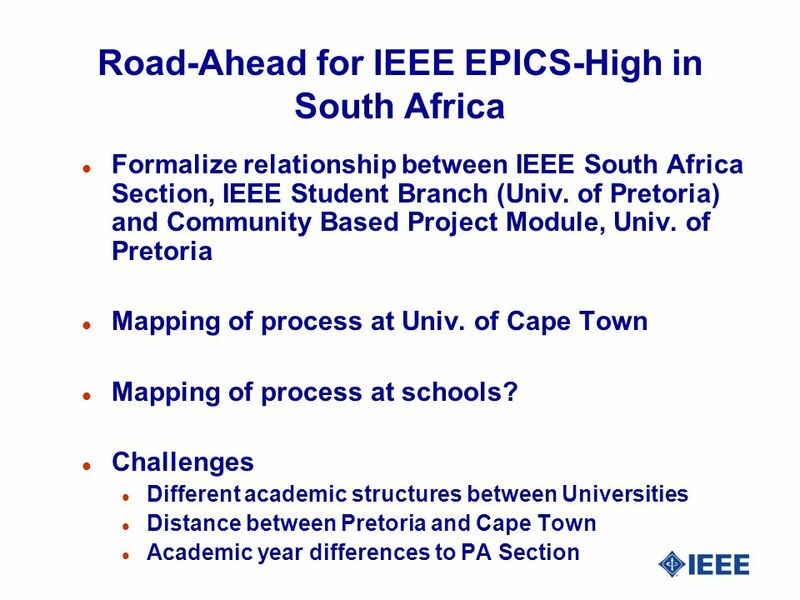 Research Training/Education Core Overall Goal - to enhance the interdisciplinary education pipeline and expand the number of persons working collaboratively. The Five Working Groups Faculty Development Scaling-Up Post-Graduate programmes and 1.Research & Development 2.Innovation 3.Industry - Institute Interaction. 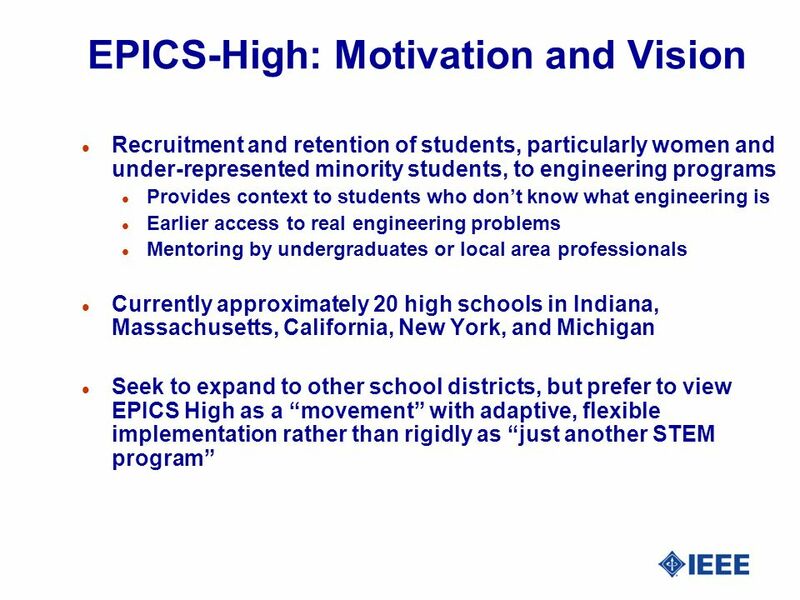 Education Strategic Plan Initiative Jul 10 Neal Barlow Jane Hansen VP EducationSAC, K-12 POC. RTI as a Lever for School Change School Partnerships for Change in Teacher Education Tom Bellamy—February 2, 2011. Taking up the Micro Enterprise challenge 6 th June 2007.